In a week when Nestle failed to protect its KitKat from copycat producers, it's good to hear that the list of foods given protection from worldwide imitation has been extended to include laverbread. The welsh delicacy made from seaweed joins the list of protected UK foods such as stilton cheese and Cornish clotted cream. 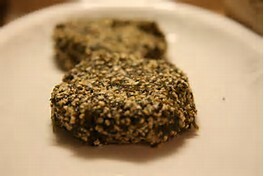 Laverbread is seaweed paste (not a 'bread') that is often rolled in oats and fried to eat with meat (below). If you haven't tried it, then here's a prompt to buy some this weekend to go with the Sunday roast. It is made from laver - a purple seaweed from around rocky shores in Wales. The dish has been awarded special designation under European law, meaning no other producer can use its name. Other goods from the Principality have already received the accolade, including Anglesey sea salt, Pembrokeshire early potatoes and Welsh lamb. The status recognises products which are produced in a specific region, like Champagne, using identified local expertise. 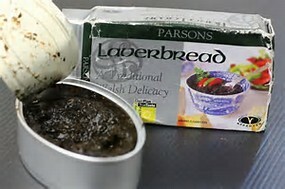 You watch now, top-end UK restaurants will exploit this new found status for laverbread. Expect to see it on every 'posh' eateries a-la-carte menu. You heard it hear first!